Veteran wing Sean Lamont has been called into the Scotland squad for the two-Test tour of Japan next month. 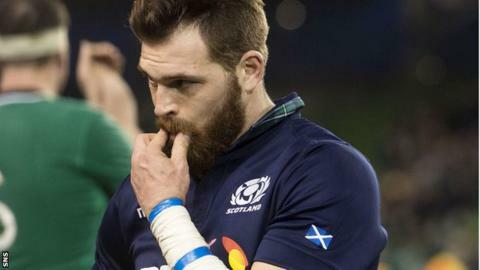 The 35-year-old Glasgow player, who was originally scheduled to "have a bit of rest at home", replaces the injured Tim Visser in the 27-man party. Visser suffered a knee problem playing for Harlequins against Montpellier in the European Rugby Challenge Cup final. Lamont will compete with fellow wings Tommy Seymour, Sean Maitland and Damien Hoyland for a Test place. He won the last of his 104 caps in Scotland's final Six Nations match against Ireland in March, but was omitted from the original tour squad in favour of Edinburgh wing Hoyland. Scotland will fly out on 11 June to Japan, where they face the Asian champions in Tests on Saturday 18 June at Toyota Stadium, Toyota City, and on 25 June at Ajinomoto Stadium in Tokyo. Both matches will be broadcast live by BBC Scotland, with 11:20 BST kick-offs. Scotland beat Japan 45-10 at last year's World Cup, four days after the Japanese caused one of the biggest upsets in rugby history by beating South Africa 34-32. Props: Alasdair Dickinson (Edinburgh), Moray Low (Exeter Chiefs), Willem Nel (Edinburgh), Rory Sutherland (Edinburgh). Hookers: Fraser Brown (Glasgow Warriors); Ross Ford (Edinburgh), Stuart McInally (Edinburgh Rugby). Locks: Jonny Gray (Glasgow Warriors), Richie Gray (Castres), Tim Swinson (Glasgow Warriors). Back-rowers: John Barclay (Scarlets), David Denton (Bath), John Hardie (Edinburgh), Josh Strauss (Glasgow Warriors); Ryan Wilson (Glasgow Warriors). Full-back: Stuart Hogg (Glasgow Warriors). Wings: Damien Hoyland (Edinburgh), Sean Lamont (Glasgow) Warriors), Sean Maitland (London Irish), Tommy Seymour (Glasgow Warriors). Centres: Peter Horne (Glasgow Warriors), Matt Scott (Gloucester), Duncan Taylor (Saracens). Fly-halves: Ruaridh Jackson (Wasps), Finn Russell (Glasgow Warriors). Scrum-halves: Greig Laidlaw (Gloucester), Henry Pyrgos (Glasgow Warriors).